Memoirs of a Traveling Ex-Linguist: Year 14: Are You Psychologically Real? So, what happened today? Well, there are still a number of things that I dealt with starting with the morning. First, I landed in Sao Paulo, Brazil and booked a ticket to Santiago, Chile. Then, upon arriving, I caught the plane to Lima, Peru, to which, as of this hour, I am airborne. Oops, I guess I am mixing fantasy with reality. I am indeed an airline geek. I have this online virtual flying game that I sometimes play. Anyway, back to reality, psychological reality. I just came back from the lab after running a participant for an experiment. Wow, I guess my activity in the Psychology Department is increasing slowly more and more by the hour. My records are now there, since I am now legally able to run experiments, having performed the educational requirements by the Institutional Review Board. I guess this has something to do again with my "rebellion" from the linguistics of my undergraduate years. See, the thing with linguistics is that sometimes, their theories may not be aligned with what really exists. There is this thing called language, and the linguists study it, and posit theories about it. But are these theories real? Do the structures that linguists posit actually exist in speakers' heads? When I was an undergraduate, I learned about linguistic models, tree structures, and how speakers transform structures in their heads in real-time, in order to build the vast amount of sentence structures that exist in any language. However, are those transformation really real? Do the linguists have proof that those transformations actually exist in the human brain? So there, I rebelled, went out and sought other flavors of linguistics. Now, I prefer the flavor of linguistics that does not isolate itself from other disciplines, and instead collaborate with other fields in their research. So for me part, I try to collaborate with psychology in my research. No wonder I decided to be an experimental linguist. So I measure things. Anyway, enough of that, it may bore you, although I am not. So, let me do my periodical book review again. I finished The Egyptologist, which to my opinion, is one of the best books I have read recently. It is written in the epistolary form, where the bulk of the text is a collection of letters, cables, and diary entries. I like this form due to the fact that it leaves the task of piecing information together to the reader. And so since this was a detective story revolving around people scattered all over the world, from Sydney to Cairo to Boston to London, then it was the most brilliant choice of form. It is about an arrogant archaeologist and his exploits, partly historical, since the novel is set around the time the tomb of King Tut was discovered. Anyway, I do not want to reveal the whole thing, so I will leave it like this. But if you liked reading Frankenstein by Mary Shelley, and Dracula by Bram Stoker, then I suppose you will like the guessing game of this novel. 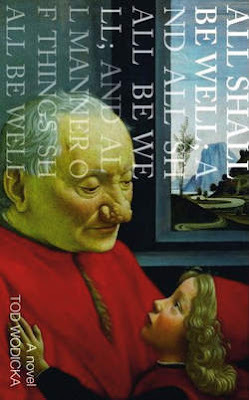 So I returned that book, and started on this new one, All Shall Be Well, and All Shall Be Well, and All Manner of Things Shall Be Well by Tod Wodicka. Very long title, and so far, it begins rather interestingly. I will review this once I am done. So there, ten days to go before I cross an ocean and head to a different land. I should finish this new novel before that, since I don't want to carry a borrowed book across the ocean and back. Speaking of things being carried, it is funny that my second draft for my qualifying paper has been back and forth the Atlantic. Why? Because I gave it to my adviser to read while he was in Paris, and now that he is back, he gave it back to me, after meeting with him and discussing the additional revisions (which are not as much as the first draft), and then I will work on it, carrying it with me when I go to Denmark, and back. I'll be working on it within this week, while on the plane, and while over there. So there, still busy, even if it is the middle of summer.